How many ways can I describe the weather outside? Let me try. Freezing, icy, snowing, wintery, frosty, frigid, gelid, inhospitable, and glacial. That about sums it up with a temperature that feels like -20 F / -28 C. Nothing is even thinking of melting. My favorite pine tree is literally groaning from the cold. I have never heard a pine tree groan until this winter, but that’s how cold it is. Yarn Rascal can’t go out without his boots, otherwise his feet hurt so bad he just falls where he’s standing. With his boots on, he walks like a cross between a penguin and a bucking horse. His front feet move like a penguin’s, while his back feet buck out like a horse trying to shake off a rider. Not conducive to quickly managing business and scooting back indoors. Yesterday I had a brief moment smugness. Congratulating myself on having had the foresight of getting everything we could possible need this winter out of the barn and putting it within a fingertip reach. No long treks through hip deep frozen snow this year. I should know better by now. The universe doesn’t like conceitedness. The Skipper’s truck had a wee bit of a challenge getting started yesterday. To be more precise, I turned the key and nothing happened. Silence. Not even a cough. I took the key out, gazed at the vast frozen tundra of blinding white that lay between me sitting in the truck and the barn where the battery charger resided. When reality, in its initial phase, egregiously deviates from what I want it to be, I have a hard time immediately accepting it. Thus, I reinserted the key in the ignition throwing all my strength behind turning that baby as far as it could go while ramming the gas pedal to the floor saying, “Come on, come on, come on.” Not a sound beyond my own voice and the wind slamming into the vehicle. I removed the key. Within seconds a gasoline smell seeped into the truck. Not only was the battery dead, but I had flooded the carburetor. I banged my forehead on the steering wheel, saying, “No, no, no.” Not another winter where I have to trudge 98 steps up to the barn in snow above my knees and a biting wind that belongs only in the Arctic region. And, in a strange way, I was right about this. From the truck to the barn was 125 steps. Last year’s 98 was from the kitchen door to the barn. When I reached the barn, the door which normally lifts so easily was frozen to the ground. A blast of wind slammed stinging little snowflakes into my face and I turned, whereupon I saw my trusty ice breaker standing 98 steps away outside the kitchen door. To get that ice breaker meant a round trip total of 196 steps. At least 100 steps too far. So I did what any formerly sane, now desperate person would do. I kicked the heck out of that door while trying to lift it at the same time. I pounded on it with my fists, I beat it with a plastic chair from last summer—do you know that plastic, when it gets below a certain temperature, becomes brittle? but I digress—all to no avail. That door was stuck to that ground better than if I had used Gorilla Glue on it. For now, the battery charger remains in the barn. But they are predicting more snow during which (oh yes!) the temperature will briefly rise. I plan to use this brief rise to my advantage. With ice breaker in hand I will enthusiastically stumble the 98 steps to the barn where I will get that door open and retrieve the battery charger. Bring on the next storm! One of the aspects of knitting that drives me nuts is sewing sleeves to the body of the knit. I need the seam created by this joining to look and be perfect. If it is not, I will rip and join, rip and join, until A) it is perfect or B) I’ve ruined sweater and sleeve and it ends up on my pile of knits to be frogged to save the yarn. What I’ve learned is a good join starts with knitting the armhole and sleeve so they are meant to fit together. 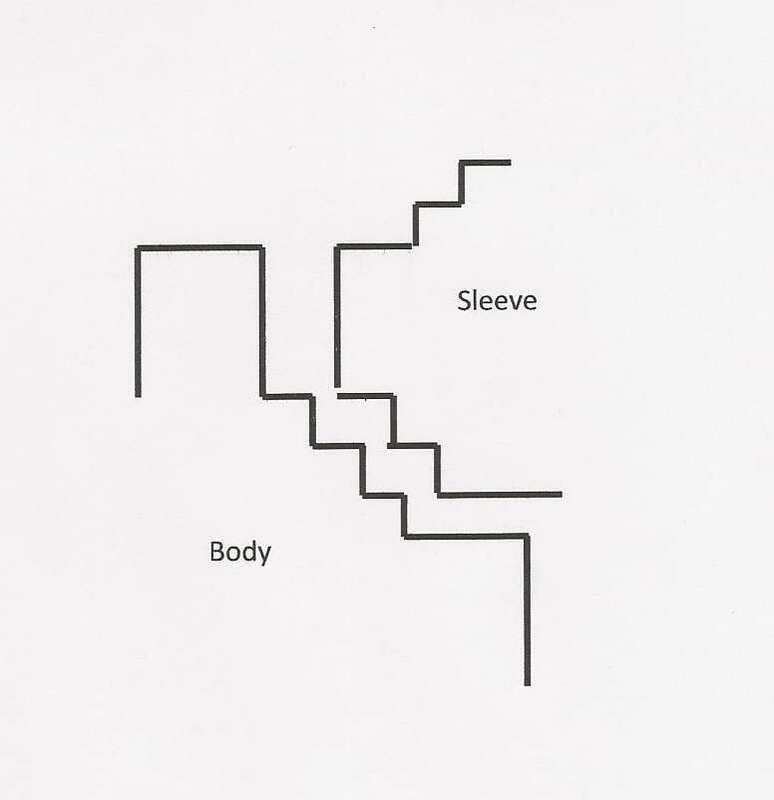 The schematic below shows how a set in sleeve should fit into the armhole: like jigsaw puzzle pieces meant for each other. To achieve this fit, I need to mirror the number and rate of bind offs performed on the armhole on the sleeve. Easier said than done. This was the sleeve cap for the Spring Sweater I just completed. It has a nice flowing curve that is bell-shaped. I point this out not to brag, but to say that unless a sleeve cap has that bell-shaped curve toil and trouble lie ahead. Therefore be aware of the shape of the sleeve cap while knitting to make sure this curve is forming. The sleeve cap has 4 sections. The 3 arrows delineate these sections. The bottom arrow indicates the first part of the sleeve cap. This first part has two rows of initial bind offs. 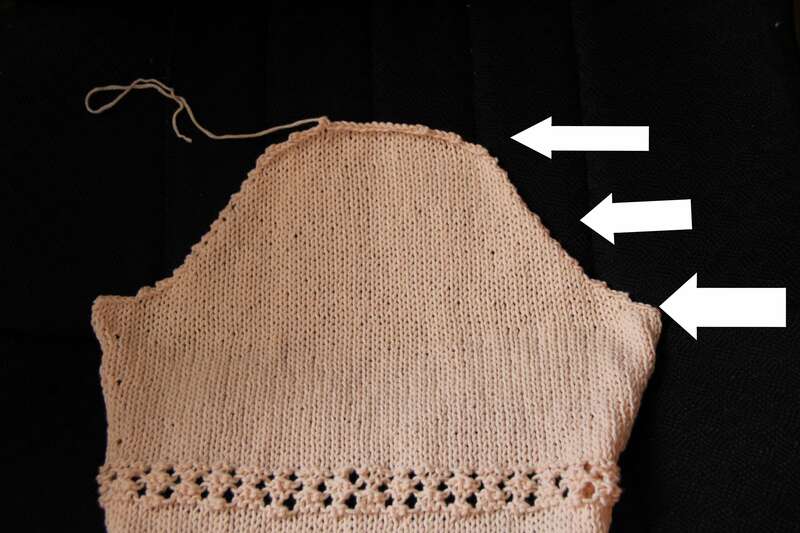 The bind offs exactly mirror the initial bind offs of the armhole. The second arrow shows the end of the second section and the beginning of the third section of the sleeve cap. Naturally, the third and second sections–the biggest and most conspicuous–are the most complicated to figure out. Remember, weeping allowed. A mistake here is noticeable. But the twisted path to getting them correct is worth it when it comes to the sewing. The third arrow indicates the fourth and final section. I think I will stop here and take a moment to address Winter. Other areas of the world are waiting for you. Although you like it here, you’re a house guest that’s over stayed her welcome. Time to move on. Take your polar winds and snow and ice, pack them in your suitcase and scram. Please don’t take this personally, it’s just time for you to go. Next post, get out the calculators, pencils and paper. It’s knitting math. Between swatching for two baby sweaters and working on the test knit for the Spring Sweater I’ve had little time to register weather reports. So imagine my surprise at 10 pm last night when my brain selected the following words from the local weather report to highlight: “historic storm”…”starting in 2 hours”… “ending Friday.” When my head jerked up to look at the television in hope that the weather guy was talking about North Dakota the screen had gone to a commercial, and my hands kept knitting. A mistake that I compounded by continuing to knit away while flailing around searching for information on what the guy just said. In the end, it would have been easier to have waited the 2 hours, looked outside and all would become clear. Yes, he meant my area. Instead, I have about 4 rows that need ripping back. Today it is snowing so hard that visibility is measured in yards, not miles. The Skipper and I are taking turns shoveling, trying to keep a few paths open for Yarn Rascal. We shovel once every two hours, that’s how hard it’s snowing. It’s full blown Nor’easter Blizzard conditions, blowing snow, the complete orchestra is playing in this little number. While I thought about keeping a path to the car viable in case of an emergency, that would mean clearing the car too of snow, and really where the heck do I think I could get to in case of an emergency? We live on back roads. Nary a plow has been seen. You can’t get there from here is a reality. Also you can’t get here from there is true too. But the best is yet to come. Ice and strong winds. After that, if the temperatures rise enough, heavy rains and strong winds. So I thought it appropriate at this moment in time to show you the back of the Spring Sweater in it’s “I’m knitted but awaiting adjustments” state. The adjustments will occur near the top on the garter st lines. 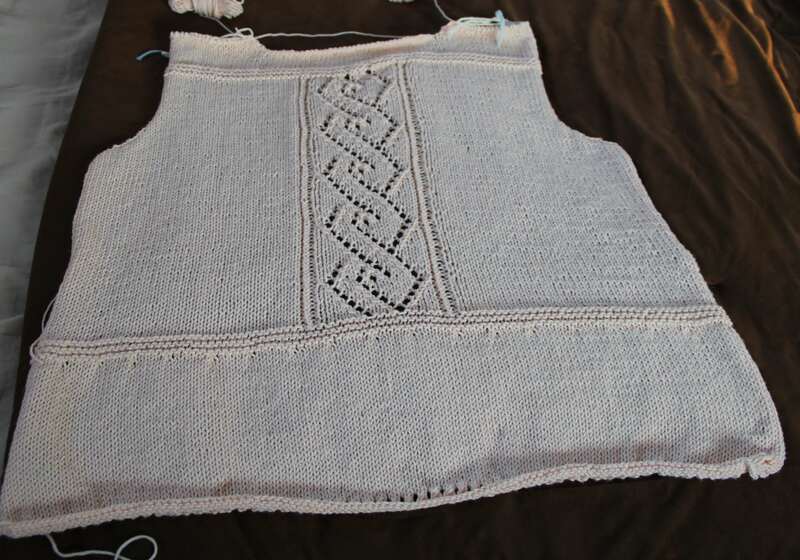 When I knitted the back and came to the top area, I realized that the designer had garter st lines going across the sweater effectively ending the lace and balancing the garter st lines at the bottom. Well I panicked. I didn’t want the garter st lines to call attention to any part of my chest and mastectomy. My strong reaction surprised me. It’s a beautifully designed sweater and part of what I like about it are the garter st lines. I wanted the back in some state of finish so I moved the garter st lines too far up. I need to rip the top of the back and adjust the garter st lines to the ones on the fronts. I haven’t reached the line area on the fronts yet, but when I do, I am going to take a deep breath and put them where the designer has them. I need to take this one step away from my fear and shame about having a mastectomy. This is why I like knitting. It is life’s problems in microcosm. Until I knit this sweater I never realized that I had stopped wearing all shirts that are my regular size. Since my mastectomy I have been wearing men’s XXL shirts instead of my usual size which is medium to large, depending on the cut of the shirt. Most of The Skippers turtlenecks and long sleeve shirts, sweat shirts, tees are hanging in my closet now. My shirts are relegated to the side of the closet that houses things I rarely wear. Don’t get me wrong, I like roomy shirts, but this hiding beneath my clothing has got to stop and it’s going to start with this Spring Sweater. To all who live on the East Coast. Happy Shoveling. What Do You Mean It’s Not Officially Winter? Snow fell again yesterday. The Weather Channel and local forecasters said it would be a quick storm starting at 7 am and ending at noon. No more than an inch (2.5 cm) or three (7.5 cm). They lied. It snowed the entire day covering all the crucial areas I dug out for Yarn Rascal. As the snow storm lingered and the day grew later my concern over Yarn Rascal’s lack of business transactions increased and I realized no amount of relaxation techniques can halt a migraine that comes from nerves stretched to the fraying point. For while The Skipper and I had no food in the house, Yarn Rascal’s pantry is always well-stocked. Thus, I spent yesterday watching crucial bare ground disappear under heavily falling snow, while Yarn Rascal packed away the food. Yes, he spent yesterday eating like there was to be no tomorrow. Bedtime came and still no business transactions. Yarn Rascal slept straight through the night, very unusual for him. Up with the sun, Yarn Rascal bounded out into the blinding white snow this morning and viola! A grand business transaction. Honestly, I don’t know if I’m going to make it through the winter sane. Four inches (10 cm) of snow and two inches (5 cm) of ice, not bad if I’m a penguin. But I’m human walking an 11 month old Bichon who is experiencing winter for the first time and…well…I’d rather be a penguin. Even in the best weather conditions Yarn Rascal needs to walk the equivalent of half the length of the Appalachian Trail before getting down to business. In snow, ice and cold it’s a walk that seems a whole lot longer. I got ready for our “little” before bedtime trek by putting on all my knitted equipment: socks, cowl, hat, mittens. Then I readied Yarn Rascal by wrestling him into his new winter jacket. I tried and failed to put boots on his flailing little feet. I’d get one on, he’d chew it off before I could finish shoving on the second boot. After struggling to put the same boot on the little octopus three times I gave up. Out we went for what I hoped was a quick business transaction. While Yarn Rascal twinkle-toed it across the top of the ice-covered snow, I kept falling through the ice cover. My gait resembled Frankenstein’s first steps as the monster comes alive. Yarn Rascal ice danced for 28 freezing minutes without performing one business transaction. Slowly, my frozen brain realized the problem. Yarn Rascal was looking for, but not finding, the scents he needed in order to get a business transaction moving. The wonderland of snow and ice had covered everything. I returned Yarn Rascal to the warm house. It took some digging, but I hit bare, albeit frozen, ground. I took Yarn Rascal back out and showed it to him. Ten minutes later and still nothing. I put Yarn Rascal back in the house and headed out with the shovel again. I scanned the smooth, white surface trying to recognize the spots Yarn Rascal particularly favored. It was amazing how difficult it was to pinpoint favorite spots with everything covered so thoroughly. I lacked reference points. One of his favorite business centers was five paces to the right of a fallen tree branch with moss growing on it. The branch was memorable because somehow it had landed in the middle of the yard well away from any tree. Where the heck was that branch in all this? In the daylight the yard looks like a shelling took place. Frozen, bare patches of land pock mark the yard in no apparent order. Yarn Rascal still takes forever to conduct business but at least he has choices. And, I am proud to say, I did find that tree branch after all.